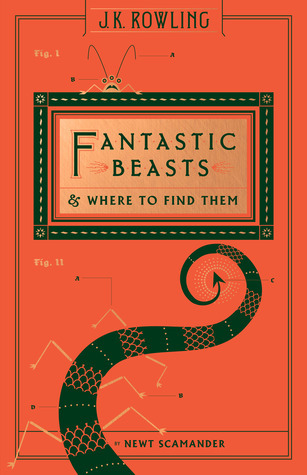 To ask other readers questions about Fantastic Beasts and Where to Find Them, please sign up. What is the difference between this and The Monster Book of Monsters? 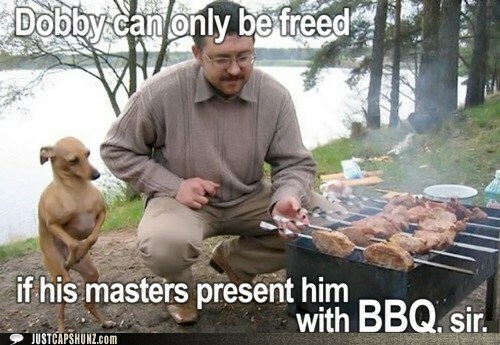 HaveSomeShawarma It won't eat you. Seriously, this is in the top 5 audiobooks I've ever listened to. First of all, it's read by Eddie Redmayne who played Newt Scamander in the movie. He read the more recent version (Fantastic Beasts and Where to Find Them: The Illustrated Edition) so it really felt like "the author" was reading us a copy of his personal book - simply fabulous! (Aside: could you imagine getting Emma, Rupert and Daniel to read their parts from the original? That would be just too aweso This is INSANE. I love it. Second of all, Every animal came with side effects. 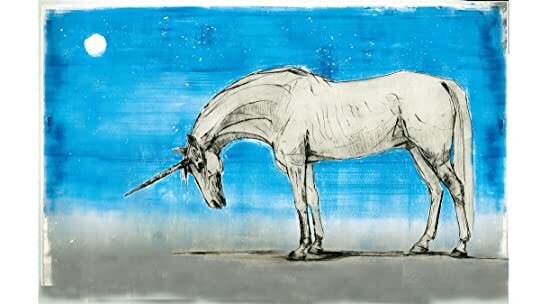 And we're not just talking about an unicorn whinny or a dragon roar. If a creature lived in the jungle - there's monkeys chattering and trees rustling. If the creature hatches from an egg - there will be eggs cracking in the background. There's one creature that does not make a sound until its death - and we actually hear the cacophony of noise. This was such a quick read (only 2 hours) but it was SO much fun. I always love it when the audiobook creator put forth so much effort into a book. This really felt like a whole new way to experience this book! Miranda Reads Christina wrote: "I fricken love that book. I read it on paper thoe"
Did you read the illustrated version or the original? Miranda Reads Brooke H wrote: "I’ve never listened to an audio book before, but I mean, if it’s Eddie Redmayne reading his character’s book? LOL y Brooke H wrote: "I’ve never listened to an audio book before, but I mean, if it’s Eddie Redmayne reading his character’s book? As a longtime fan, I am just reveling in this latest illustrating the HP books trend. 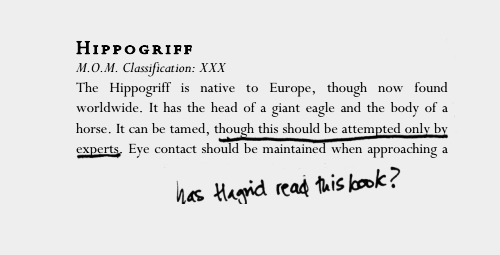 Especially considering J.K.'s original bestiary gave scant descriptions of (some) wholly unknown and many extremely quirky creatures. Literally, over the moon. 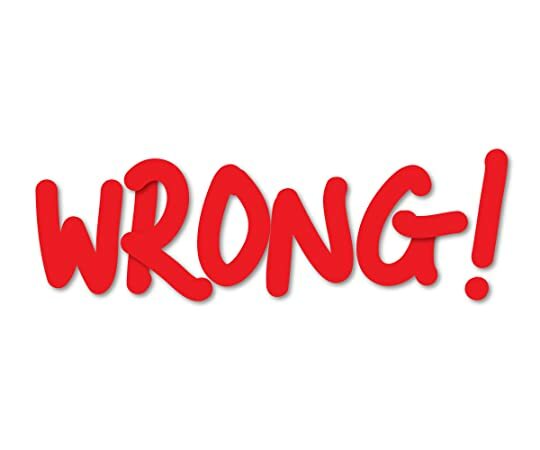 I was permitted to reissue the book only on that a disclaimer was included, assuring Muggle readers that it was a work of fiction. 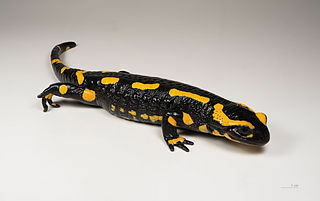 We now have new creatures, including the Hodag, Horned Serpent, Thunderbird, Hidebehind, Wampus Cat and Snallygaster (my favorite), which brings up the total to 81. to reflect Newt's journey to America. 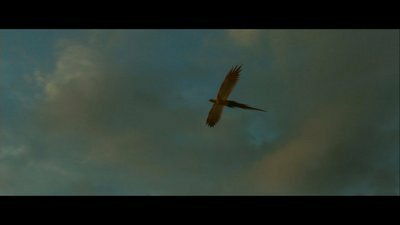 Within the new creatures descriptions are references to Ilvermorny (U.S. version of Hogwarts). 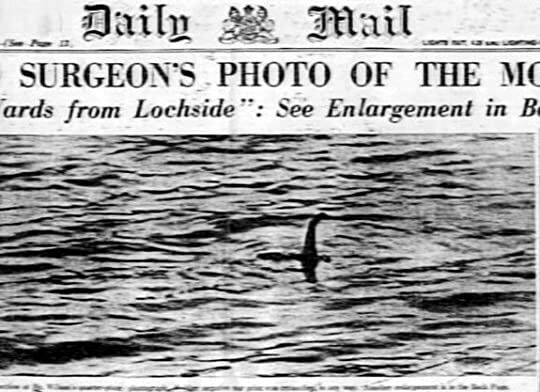 Figure 1: Snallygaster - part lizard, part bird that is sometimes mistaken as the Loch Ness Monster - in part due to its curious nature. 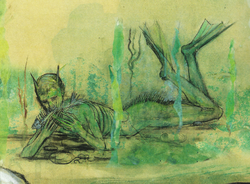 Figure 2: The "Grindylow" - a water demon. Famous for ruining Fleur de Lacour's chances at eternal glory. 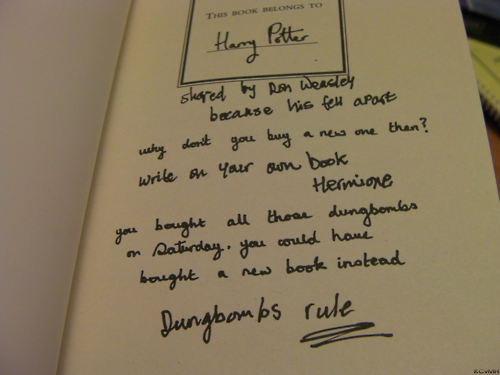 Absent from this edition, the painfully small scribblings from Harry, Ron and Hermione. While I miss l missed their quirky musings and chatter, the full-color illustrations more than make up for that. This is truly a beautiful book. 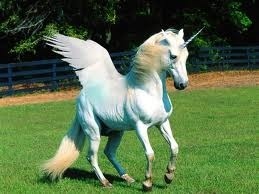 Figure 3: The Unicorn - by far the absolute best mythical creature in the world. "ملحوظة قبل البدء: هذا الريفيو قد تراه مجرد هراء..ولكنه الخيال، نعمة الهروب من ضغط الواقع ولو للحظات"
هذا الكتاب لا يحكي حكاية مؤلفه كالفيلم الحديث، وانما كت "ملحوظة قبل البدء: هذا الريفيو قد تراه مجرد هراء..ولكنه الخيال، نعمة الهروب من ضغط الواقع ولو للحظات"
ستجد ايضا مخلوقات ووحوش اعتبرناها "اساطير محلية" كوحش الثلوج و "الغول" و المذئوب وحوريات البحر وحتي الحقيقة وراء وحش البحيرة "لوخ نيس"
او ستتعرف علي الجنيات و الترول والعفاريت القزمة الإيرلندية"ايمب"
اما اذا كنت متابع جيد لسلسلة هاري بوتر فستجد عن بعض المخلوقات التي قد تعرضت لها في الروايات "او حتي في العاب الفيديوجيمز المبنية علي الافلام ستجدها واضحة جدا"
هذا الخبر الذي صدر في 12 سبتمبر 2013 أدي الي رفع معدلات المبيعات بدرجات كبيره ورفع اسهم هذا الكتاب في محركات البحث بالرغم من ان اول طبعاته ترجع الي 2001"
حسنا في النهاية حتي اذا لم يكن لك سابق قراءة سلسلة هاري بوتر ولكن قد شاهد جزء من احد اجزاء الفيلم..فانصحك بتجربه هذه الموسوعة الصغيرة لتستمتع برحله لعالم اخر..
As a proper witch (muggle born), I was required to have a copy of this book as Professor Dumbledore declared in the foreword that “no wizarding household is complete without a copy of this book.” So I wasted no time and got myself a copy at Flourish and Botts! My very own duplicate of Harry Potter’s copy and I enjoyed it a lot especially Professor Dumbledore’s foreword! You only have to read a part of his foreword to be convinced to read the book. But what I enjoyed even more were Ron’s, Harry’ As a proper witch (muggle born), I was required to have a copy of this book as Professor Dumbledore declared in the foreword that “no wizarding household is complete without a copy of this book.” So I wasted no time and got myself a copy at Flourish and Botts! Billywig, Gnomes, Kneazles and of course Hippogriffs are some of my favorite magical creatures! This is the best schoolbook ever! It’s informative, creative, smartly written or more accurately, very nerdily written, fun and of course, magical! 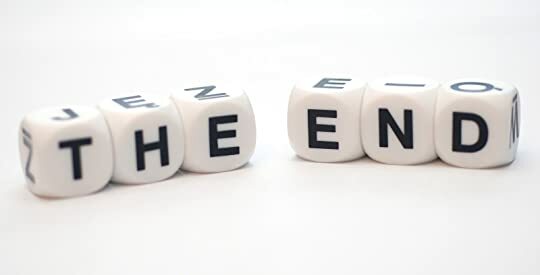 It prolonged my magical experience and I couldn’t stop myself from ending my sentences with exclamation marks! It’s like J.K. (yep, we’re that close) knows exactly what I need! Thank you! <3 Now I’m even more excited for the movie! Important: This is the original reference book, published by JK Rowling and not the 2016's novelization of the movie with the same title. This reference book about the magical beasts in the world of Harry Potter is truly fantastic! While I have no doubt that the decision of doing movie adaptations about this reference book is basically to keep "milking" the magic cows of the Harry Potter's saga, now that I finally read the reference book, I have to admit th Merlin's beard!!! While I have no doubt that the decision of doing movie adaptations about this reference book is basically to keep "milking" the magic cows of the Harry Potter's saga, now that I finally read the reference book, I have to admit that there is a lot of material here to be used on movies and even showing several creatures that you never read about on the novels of the saga. 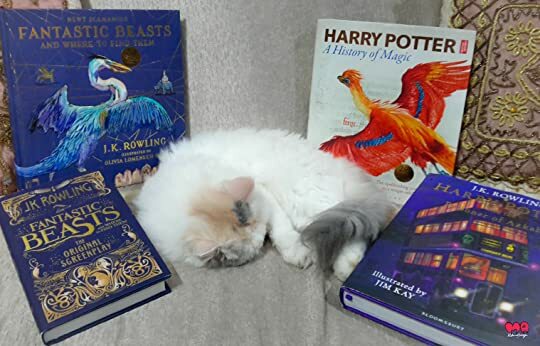 Obviously you will "learn" about known beasts like dragons, centaurs, werewolves, basilisks and even acromantulas, you will read too about many other fantastic beasts with detailed info about each of them and that they never appeared on the seven novels of the series. J.K. Rowling did a magical work here! 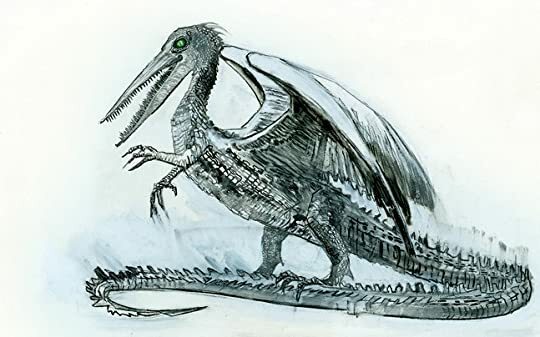 It's truly amazing so much imagination and details that she developed here, even more impressive taking in account that many of those creatures never appeared in the saga. Also, you will read about all the politics behind of defining how to control those beasts even on times before of the existence of the Ministry of Magic! 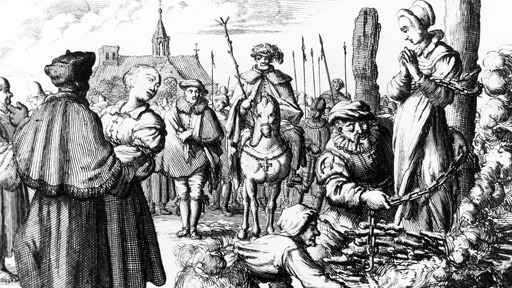 And of course, also, during the course of the ministry, even detailing how complicated and polemic became to classify certain creatures easily seen as beings instead of beasts. Definitely this is a quick but wonderful engaging reading of the magical world of Harry Potter. و يبقى أهم سؤال يطرحه هاري. . (3.5?) I really loved the intro but I was disappointed that there was no picture of each beast. Still, it's always nice to go back in that universe! J.K Rowling is a clever witch. She conjured up a beautifully imaginative world when she wrote the Harry Potter series, and she only cements it here. I love the fact that we actually get to read a physical book that appears in her universe, as if we were students at Hogwarts school of Witchcraft and Wizardry. It’s a great idea and I think only add depth to her story. 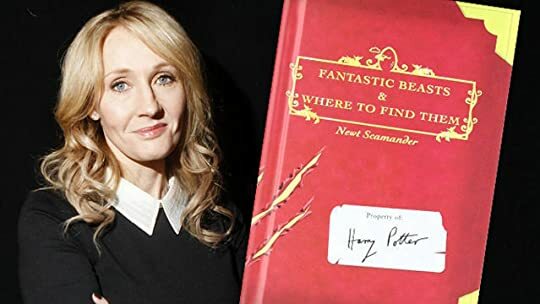 It also shows how early on she was thinking about Fantastic Beats (the movie) and reading this adds a little more to that brilliant J.K Rowling is a clever witch. She conjured up a beautifully imaginative world when she wrote the Harry Potter series, and she only cements it here. I love the fact that we actually get to read a physical book that appears in her universe, as if we were students at Hogwarts school of Witchcraft and Wizardry. It’s a great idea and I think only add depth to her story. It also shows how early on she was thinking about Fantastic Beats (the movie) and reading this adds a little more to that brilliant film. How can we say it is A Good Fiction? For me one of the elements that make me fall in love easily into a fiction book is how realistic it can be. ofcourse not the"non-fiction" realistic, but real enough that makes the world very fantasy and at the same time acceptable to imagine it easily. I don't know how to explain but just look at that world J.K.Rowling "AKA:The Queen of United Magic Kingdom" creates..Wizard and Witches lives deep in London, across the UK and even all over the world. They got th How can we say it is A Good Fiction? They got their way to hide from us -The Muggles; the non magical folks :)- and since there's "real" wizard and witches in that world -our world ; the one created by Rowling - there's also magical creatures, pets and beasts.. 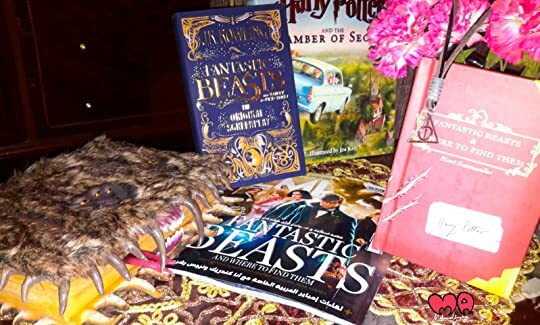 The Book Starts with a introduction to get to know the author of this Mini-Encyclopedia "Newt Scamander" who had traveled the world to collect these precious information about the magical "Fantastic" creatures. 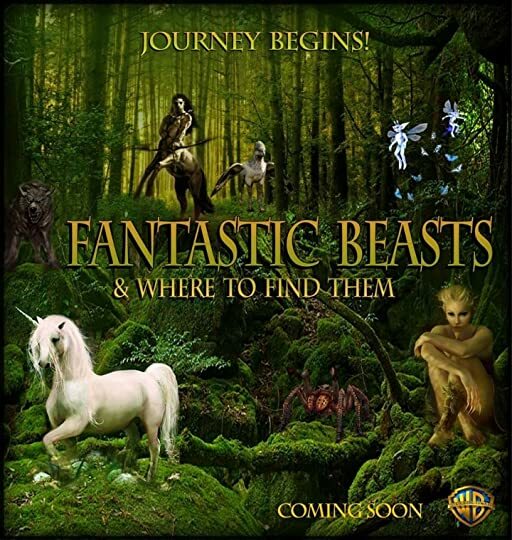 And then the encyclopedia of the Fantastic beasts and creatures starts, with it's origins and legends and how dangerous it is,in a very funny way yet keeping a professional tone of Encyclopedia. 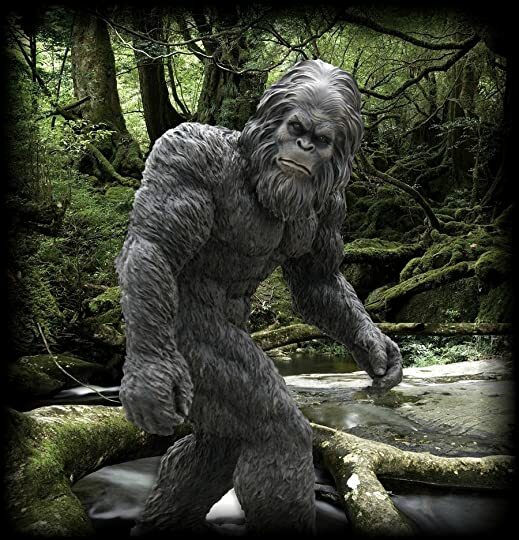 Rowling takes us in a "brief" journey into the fantastic world of these beast and creatures, The Great thing here is that some of those are common, even famous among our "Real" world..such as the paranormal, mysterious creatures like "Loch Ness" , "Bigfoot" and even the trolls. May be there's some complains of the lack of pictures, but I believe it isn't that disadvantage since some of the creatures are known previously from old legends and myths and others the writer just prefer that you'd let your imagination works on its own. 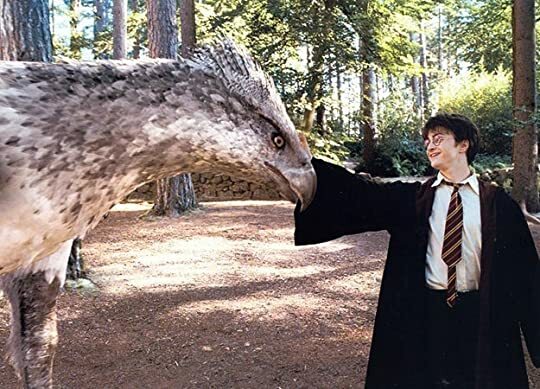 I didn't like it also at the beginning but find it better later, and I find out the creators of the Harry Potter Video Games that based on the movies take the descriptions of many of the creatures that appears at the games from that books since most of them wasn't at the novels or the movie itself. Did you watch the trailer of the movie adaptation of this book and think, like me, that the book is about a bunch of magical creatures escaping into the world and wreaking havoc, threatening the balance between magical and non-magical relations? Did you imagine action and chaos? I swear, that's what I thought I was going to be reading about. I Did you watch the trailer of the movie adaptation of this book and think, like me, that the book is about a bunch of magical creatures escaping into the world and wreaking havoc, threatening the balance between magical and non-magical relations? Did you imagine action and chaos? I swear, that's what I thought I was going to be reading about. I never read the blurb for the book, not once. Not even before I started reading-to at least know what I was getting into. I just walked into this book blind. So we've been duped then! No we've not. 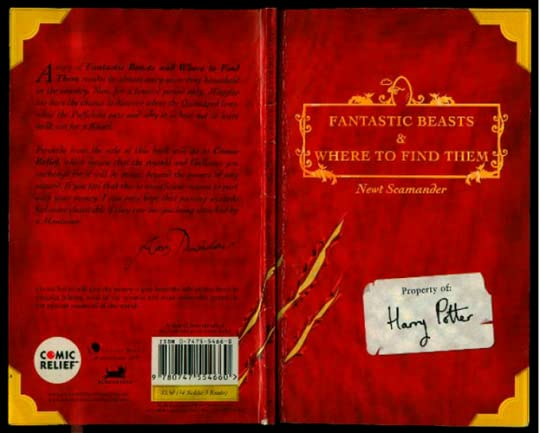 This book is genius: We've been given our very own directory of monsters fantastic beasts. I no longer have to wonder about why the centaurs never wear clothes, or what would happen if I ever meet an Acromantula- I won't live to tell the story, that's what. 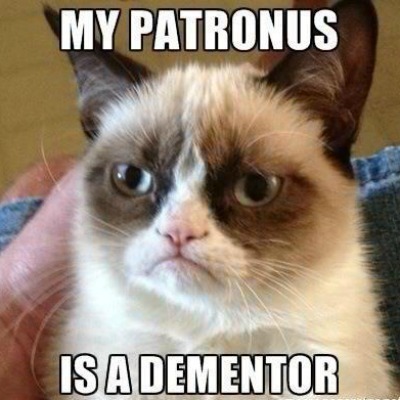 Oh J.K, do I love you or what! I had so much fun reading about the different beasts Potter's world has to offer. I've always been curious about the many creatures I read about in the Harry Potter series. And in the same vein, I've too been curious about those that never left the dark, those many others I never encountered but knew existed. My curiosities have finally been laid to rest. ↪ Just look at how they're desecrating the sanctity of a school book! **eyebrow dance** Don't we all. 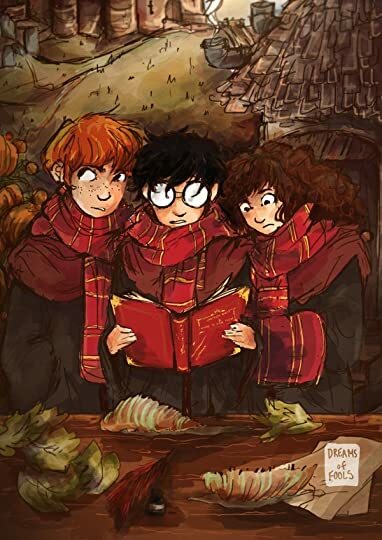 This is a school book for students at Hogwarts documentation which holds a register of all known magical creatures in the wizardry world from A-Z, written by Newton Artemis Fido Scamander. 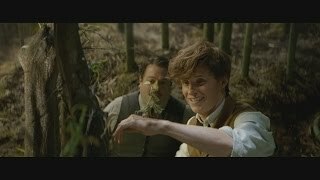 Try saying that without slicing your tongue in half - just Newt Scamander. ▶ It gives valuable information about the geographical distribution of all creatures, what areas they're restricted to, places they may be found, and even the places where they're believed to have originated from. I know now never to venture into the black forest of Germany, for there lies the Erkling. And me love life. 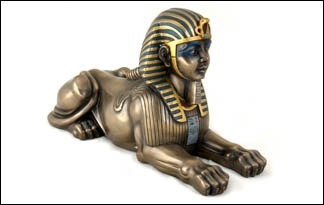 ▶ It offers a classification of all creatures based on dangerousness and perilousness of a creature. ▶ It helps you understand why so much effort is put into hiding the wizardry world from muggles: to ensure that future generations of witches and wizards enjoy their strange beauty and powers as we have been privileged to do. ▶ YOU'LL FIND FUNNY REMARKS AND COMMENTS BY EITHER RON, HARRY, OR HERMIONE? WHO KNOWS? 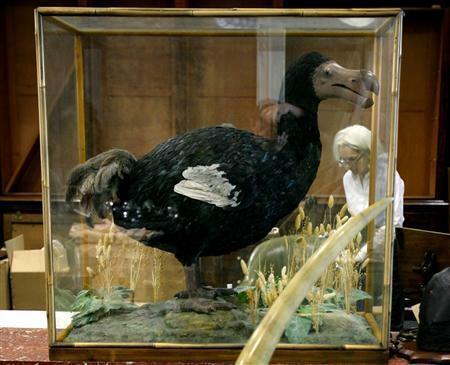 The I965 ban on Experimental breeding has made the creation of new species illegal. ↪ But no one's told Hagrid. **Snort** Yes. 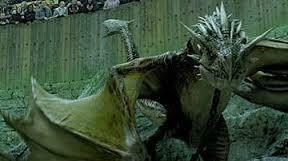 Because that thing we met in the Chamber of Secrets looked very much like a common garden snake. Option 3: Hmmm...I really don't think it's worth crawling across the floor for. And I don't think you'll get very far either trying to run away from what you learned. But you can try! Option 4: QUITE DISGUSTED --Like I was when I found out what love potions were made from. I always assumed they were made from plants of some sort. What did/do you think? Okay, so now you want to know what they're really made from. Or you think you want to know. My condolences to all those who have drank one. And yes, I'm SO FREAKING HAPPY I READ IT!!! Now I know a great deal about the many creatures that roam Potter's world. I'm ready for the movie!!! Gimmeeeeee. I had always been fond of the books I gift to Archit and I'm glad that this book falls under that "a la carte." I'd had never got to read a physical copy of Fantastic Beasts, had it not been for him who dragged me into these kind of activities. This book, for me, is more about the amusement my husband had when he was opening the gift wrapper and how it turned into surprised look on his face -to the state of speechlessness- to th draco dormiens nunquam titillandus - Never tickle a sleeping dragon. This book, for me, is more about the amusement my husband had when he was opening the gift wrapper and how it turned into surprised look on his face -to the state of speechlessness- to the bliss of broad-smiling face- to astonishing and twinkling eyes -to wonder-struck pauses- to confused eye-brows -to bewildered fingers that were trying to explore the book -to nonplussed reactionary-reactions - and he was stupefied by the dazzling of the moment, feeling tricked and bamboozled cause the book was given to him from nowhere. Holding a copy of Harry's book is a feeling that has got one word- ecstatic. Looking at the him holding that copy of Fantastic Beasts made my day awesome. Reading about the Fantastic Beasts was a hell of an experience. 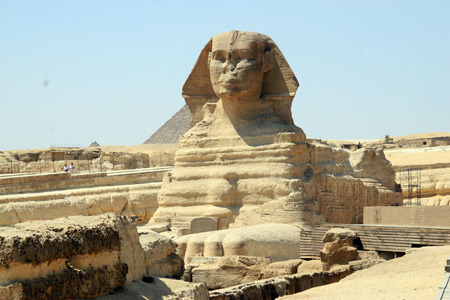 At one point I felt I'm into Greek Mythology, at another I was into Egyptian Mythology. 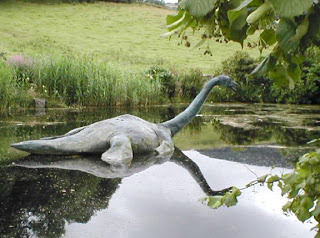 It left me wondering about all those creatures that will now rule on my dreams and some on my nightmares. It was fantastic to become an Hogwarts Student again. It was marvelous to wear the robs and playing with the wands again. I am going on a quest to find the beasts that are roaming around the world. I guess I expected something a little more. I mean, there's a whole movie out there now that I still need to watch, but this, aside from a few humorous anecdotes, is just a short encyclopedia! Not that it didn't have it's moments, of course, particularly how some wizards use ghouls as pets and talking points at parties, or Ron's funny scribbled interjections in the text, but on the whole it was just a what's-what breakdown of the magical creatures seen through the movies. I give it a three for she I guess I expected something a little more. Reading this is like being a Hogwarts student yourself. I know I'm too old to get a letter from an owl, but whatevs... I'm still waiting for my Hogwarts letter. The sad realization that reading Hogwarts Library books is as close to feeling like a Hogwarts student as it will ever get. Well, one thing is for sure. Hogwarts is my dream school. Everything magic-related is my thing. And this book would have been a treat to study (dragons are far more fascinating than bacteria). On the other hand, if I had to learn all this stuff, I'm sure I would have not liked it that much anymore. :D Because having to never worked for me in school. I tended to hate everything that was mandatory. Anyway, this is a fun little read that will take you back to the wizarding world of Harry Potter. What happens when you see: 3 stars review + J.K. Rowling + Harry Potter world? 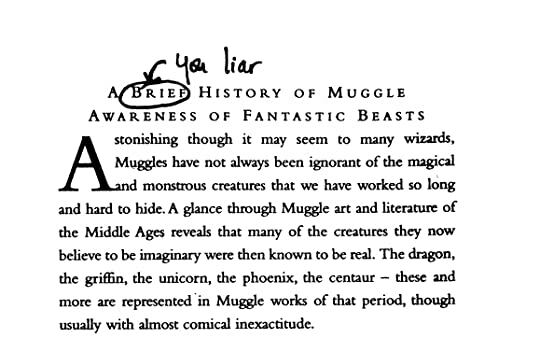 But see, the thing is, no matter how funny the handwritten notes in the book were, no matter how much I giggled at them and the introduction and every time they mentioned the word "Muggle", the content of the book itself was... boring. Hey! Don't make those faces at me! I'll explain: The thing is, I'm not entertained by reading tye descriptions of the 75 so far known species of fantastic beasts. Sure, they're interestin What happens when you see: 3 stars review + J.K. Rowling + Harry Potter world? Hey! Don't make those faces at me! I'll explain: The thing is, I'm not entertained by reading tye descriptions of the 75 so far known species of fantastic beasts. Sure, they're interesting and I'm glad I now knoe how they look and behave, but... I feel like I'm reading a school book! "But that's what you just did! ", you're saying. Well, yeah, this is supposed to be a Hogwarts text book. I couldn't expect to be as blown away as I was with the original series. Still, it was a little tedious, especially since I read it in less than a day. I need to praise the author, though, for writing this. Every time I read about another of the creatures in this book, I told myself, "wow, she really gave lots of thinking for this... 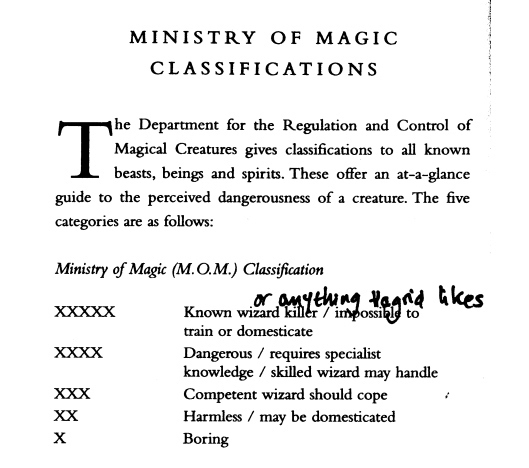 I mean, these are the descriptions for magical beasts! 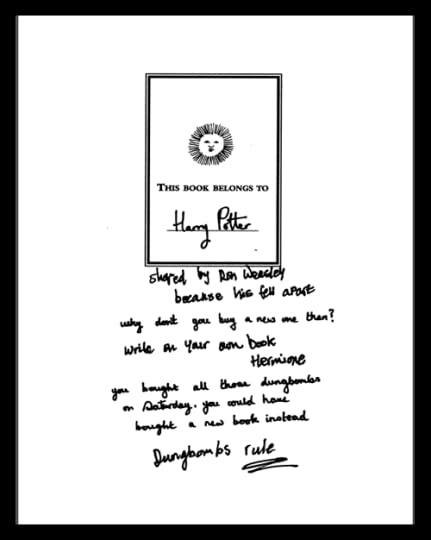 And of course, since this edition is supposed to be a copy of Harry's own book, it's full with things he and Ron Weasley wrote. Honestly, I'm very grateful for them, because they made the book more bearable, and please, I can't deny they were hilarious. I mean, what's better read after reading Prisoner of Azkaban? PS: so far the Art much lower than what I expected 😢.... No offence to the current illustrator, but why not Jim Kay? Who's doing a very good work at Potter series? For just a few hours, you can pretend to be a Hogwarts student and trust me, it's the best feeling in the world! ...to the most amazing new adventure you'll ever experience. You know, apart from that with you know who, what's his name, that Potter guy? Für alle Harry Potter Fans ein Muss - für alle anderen einfach überflüssig. Es ist eben eine Art Lexikon. Schwer zu bewerten, um ehrlich zu sein. 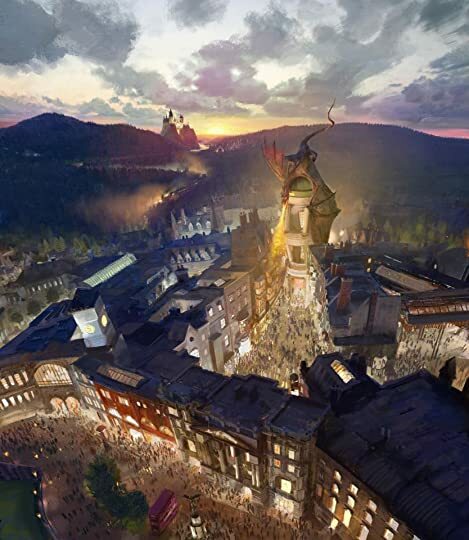 Oh, the hogwartiness and yet the outside of all that, that Newt brings to this is a breath of fresh magic! I loved seeing and hearing about the animals and his passion for them. He's like a small Hagrid. I love that. I know my husband's gonna love this bc he's like a tall, skinnier Hagrid too. I loved the rating system, so you knew what to expect. I wanted to read this book, not the scripted, nor see the film- first. 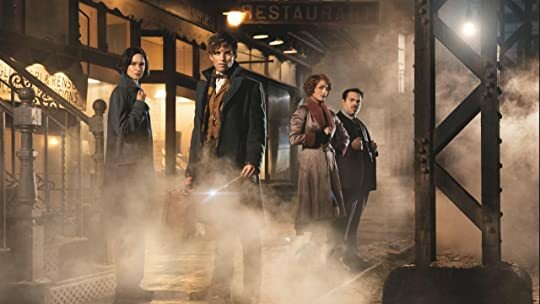 I wanted this to be my first experience with this branch of HP or the Wizarding Oh, the hogwartiness and yet the outside of all that, that Newt brings to this is a breath of fresh magic! I loved seeing and hearing about the animals and his passion for them. He's like a small Hagrid. I love that. I know my husband's gonna love this bc he's like a tall, skinnier Hagrid too. I loved the rating system, so you knew what to expect. I wanted to read this book, not the scripted, nor see the film- first. I wanted this to be my first experience with this branch of HP or the Wizarding World. The pictures are beautiful. I cannot wait until I go to Universal and be the biggest geek ever w my husband someday. “Harry: This book belongs to Harry Potter. Hermione: Why don't you buy a new one then?